When her elderly friend and mentor asks for a favor, Tansy can't refuse. But returning her friend's heirloom to its rightful owners will sweep her halfway around the world and into a twisted family history of romance, intrigue, and danger. Frustrated by his grandfather's mounting pressure to locate a lost family treasure, Sebastian Sandoval decides that serving as a tour guide for the lovely American he met on the plane is just the distraction he needs. But the secrets they're keeping threaten both their blossoming romance and their faith in God. Second place winner in the Romance Writers of America Faith, Hope, and Love chapter's "Touched By Love" contest for Short Contemporary Fiction in 2009. Tansy Chastain cradled the elderly woman’s frail hand in her own and waited for the raspy cough to subside. The skin under Tansy’s fingertips was as thin and fragile as the pages of a well-loved Bible, a painful reminder that her friend’s body was wearing out cell by cell. When the woman’s breathing eased again, Tansy reached for the button to call a hospice volunteer, but the sudden strength in Eva’s grasp stopped her. “What is it, Eva?” Tansy met the woman’s eyes, faded to the color of dust. Tansy pursed her lips, more concerned about Eva than the long-forgotten object the woman had rambled about all morning. It wasn’t like Eva to be distracted during their interviews. She would talk, tell stories, and point out details she wanted to make sure Tansy included in her memoir, but she never rambled. “No. It has to be delivered—” Eva started to cough again. Tansy reached for a tumbler of water on the bedside table and held the straw to Eva’s lips until she was able to take a sip. Tansy inhaled. Underlying the sweet scent of the potpourri placed in every room at the hospice was the sharp antiseptic tang of professional medical care, a reminder that Eva’s time on earth was coming to a close. The recent transfer to the hospice was surely to blame for the old woman’s anxiety. She had never seemed so insistent. Tansy stroked the old woman’s arm until Eva relaxed again. Tansy grimaced. Traveling halfway around the world to return stolen property to a complete stranger was several thousand degrees outside her comfort zone. She rarely left town, much less hopped flights to the southern hemisphere to plunge headlong into a decades-old family battleground. “I’ll do it.” Her heart started to pound as soon as the words left her lips. Tansy brushed the words aside. Answer to prayer or not, she would do this thing because she loved the old woman too much to disappoint her. “Now help me sit up so I can see you properly,” Eva said. Tansy complied, lifting Eva’s fragile form and propping her up with pillows placed behind her back and shoulders. When the woman was settled, Tansy leaned back in the hard plastic chair and picked up her notebook. Eva nodded with apparent satisfaction. Sebastian stared at the sparse, dying grass that covered his mother’s untended grave. He was four years too late. He scuffed the toe of his Italian loafer against a crispy brown weed and re-read the name carved into the plain granite marker. “Darcy St. John Sandoval.” No dates. No inscriptions declaring her a beloved daughter, wife, or mother. Sweat trickled down his spine in the oppressive Florida humidity. He slid trendy sunglasses over his eyes, his mind congested with unanswered questions. What would drive a woman to desert her only child, steal a precious heirloom from her late husband’s family, and end up in a pauper’s grave? Sebastian made the sign of the cross before he turned away from the grave and pulled his keys from his pocket. Tiny hurricanes of dead leaves swirled around his feet as he walked back toward his rental car. He got behind the steering wheel and jabbed the key into the ignition. He could try to talk to his abuelo again. He grunted. Who was he kidding? Eduardo Sandoval would never relinquish the family’s holdings to the grandson whose mother had committed an unforgivable crime, dishonoring generations of Sandoval tradition. Sebastian slammed the black sedan into gear and pulled away from the curb. Fingers of gray-green Spanish moss brushed the sedan’s roof in a silent farewell. Tansy pulled into the driveway of Eva’s Victorian house later that afternoon with her suitcase already tucked in the back of her ancient car. Inside the empty house, she added the packet of papers into her ratty canvas messenger bag and then headed for Eva’s bedroom. The jewelry box was empty. Tansy ran her fingers around the interior until she felt the hard ridges of a key. Her brows rose. She’d half expected this to be a wild goose chase. She peeled back the emerald satin lining and removed the key from its hiding place, then climbed the stairs to collect the mysterious stolen object from the antique camelback trunk in the far corner of the attic. Tansy dropped her bag and stuck the key in the lock. The key turned easily, and she felt the lock open, but when she tried to lift the lid, it wouldn’t budge. She trotted back downstairs to retrieve a crowbar. After fifteen minutes of wrangling, and with the back of her neck sticky with sweat, the lid yielded. Nestled in a frothy bed of pale pink tulle was a knobby black walking stick, its silver handle molded in the shape of a fox. The fox’s bushy tail wrapped around the top of the stick. Tansy lifted the object and balanced it across her palms, noting its surprising weight. If Eva’s perceptions were true, the innocuous item had cost Eva her husband, and years later, her daughter. The possessor of the walking stick held great power in the Sandoval family, including the right to control the family’s massive fortune. For Eva’s family, the walking stick had brought nothing but grief and sorrow. In the wrong hands, she’d warned repeatedly, it would bring danger to Tansy as well. A door banged shut downstairs. Tansy jumped, clutching the walking stick against her body. Since Eva’s relocation to hospice the household staff had been laid off. No one should be in the house. Tansy held her breath, listening. Another thump followed by muttered curses jolted her nerves. Then the screen door slammed shut with a squeak and bang. Tansy crept toward the solitary window at the end of the attic and peered out. An unfamiliar vehicle was parked next to her car in the narrow driveway. Two men came into view just below the attic window and Tansy pressed her forehead against the glass. They shook their fists and pointed fingers at each other in an apparent argument. Both had black hair and were dressed in dark overcoats. The heavier one opened the driver’s door and motioned to the taller, leaner man, who turned toward the house and looked up. Tansy jerked back from the window, then leaned forward again. He was a handsome man, except for the venomous expression that marred his features. When the pair drove away, she pulled the pink tulle out of the trunk, realizing as she did that it was a vintage party dress, something from the 1950s or ‘60s, perhaps. She shrouded the walking stick in the fluffy skirt and jogged back downstairs and out to her car, where she popped the trunk, shoved the stick and the dress into her large suitcase, and slammed suitcase and trunk shut. Adrenaline coursed through her arms and legs as she drove to the airport, glancing frequently in the rearview mirror for a black sedan or any sign she was being followed. She parked in the long-term parking lot and hoisted the suitcase out of the trunk, then stopped. Question 1: Have you ever traveled to a foreign country? What was the scariest thing about it? Answer 1: Not knowing the language and being unable to communicate was distressing, and gave me more compassion for immigrants to the U.S. 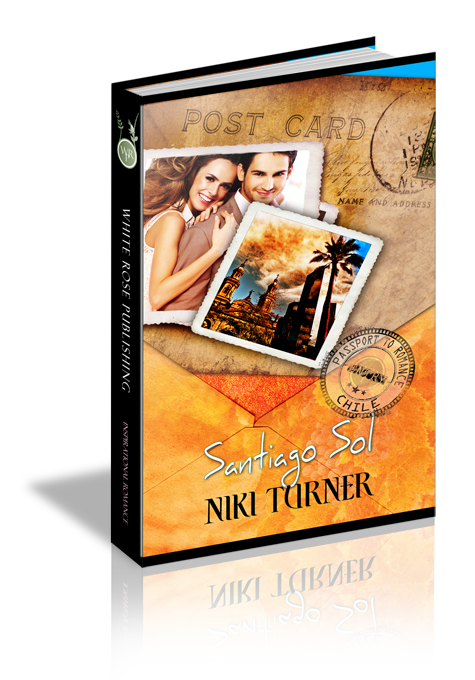 Question 2: Tansy agrees to travel to Santiago at the request of her aging friend. Is this an example of honoring your elders, being a good friend, or both? Answer 2: Both. Tansy is acting on John 15:13, which says, "Greater love has no one than this, than to lay down one’s life for his friends." She doesn't actually lay down her life, but she does have to lay down her fears, and her comfort zone. Question 3: Sebastian doesn't agree with his grandfather's demands, but he's willing to submit to them anyway. Shouldn't he fight for his rights, instead of acquiescing? Answer 3: Someone has said that the only right we have is the right to walk in love. Sebastian would rather step aside, giving up his “rights” as heir, out of honor for his grandfather than demand that his grandfather change his mind about the terms of the inheritance. Question 4: In your definition, what is godly submission (as a wife, a child, or simply as a Christian)? Answer 4: Godly submission can be defined as "a respectful response." It is not a blanket agreement/approval of authority, or enduring tyranny or abuse. Although Sebastian disagrees with his grandfather, he is always respectful of the man. Question 5: The secrets in Sebastian's family history have a negative effect on subsequent generations. What kinds of secrets do we keep from our children/grandchildren that could come back to haunt them? Answer 5: In families where harmful secrets are kept hidden, those negative behaviors are often passed down to the next generation. Open communication and honesty should be the hallmarks of the Christian family. Question 6: Is it ever all right to lie, either by omission or commission, as Sebastian does when he gives Tansy a different last name? Answer 6: The Bible is filled with examples of people lying to get their way, lying to get out of a bad situation, and sometimes just lying because they were bad people. Lying always comes back around and bites us, or causes harm to our loved ones, sooner or later. Question 7: Would you be reluctant to marry someone from a different culture? Why? Answer 7: Every culture has deep-seated differences, but with common ground in Christ and good communication, marriages between difference cultures can work just as well as marriages from similar cultures. Question 8: At any point in the story did you feel Tansy was taking too much of a risk? What determines whether a risk is appropriate or not? Answer 8: Risks taken for the right reasons are very different from risks taken in selfishness, or fear. Risks taken out of love for others, love for God, are good risks, with a heavenly reward. Question 9: Have you ever had a much older friend who was like a surrogate parent or grandparent? Would you be willing to play that role for a young person in your own life? Answer 9 There is much wisdom to be gleaned from our elders, and much comfort and care that we can offer them. Hopefully, if we will nurture those relationships in our youth, we'll find ourselves filling that role for others when we are in our sunset years. Question 10: What kinds of things have you done, or could do, to honor your elders (parents, grandparents, elderly friends, etc.)? Answer 10: Offer to help out with tasks that might not be easy for them anymore, like going to the grocery store, or tackling heavy housework. But most importantly, spend time with them, listen to what they have to say, and don't ever forget there's a young person in there in spirit!